SearchWP’s engine configuration can be modified at runtime, allowing you to modify your search engine configuration based on customizations from user input. This walkthrough guides you through the process of adding form elements to your search form allowing visitors to customize their search experience. For example: using SearchWP you can allow your site visitors to selectively search only titles. You could also allow them to optionally include searching Content. An engine could also be configured in real time to only search Documents within the Media library. 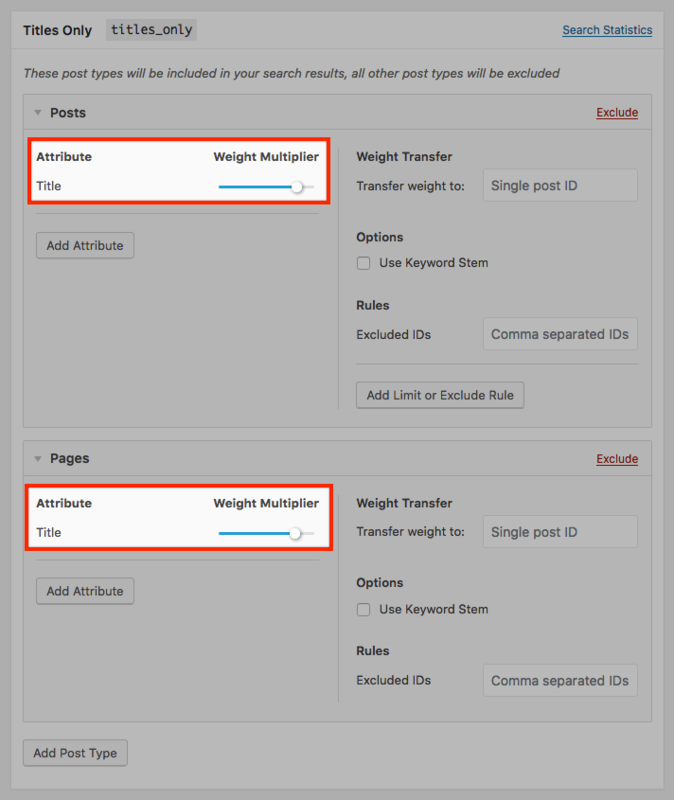 This article will cover customizing your search form to limit searches to Titles only, but this implementation can be customized in any way the SearchWP engine settings can be customized. NOTE: As a starting point for this implementation you will need to configure your search engine with proper defaults. For example in order to build the document search portion you will need to ensure that Media is enabled for the engine, as SearchWP will not index disabled post types. If you’re working with a supplemental search engine you can simply add the applicable form elements by hand when implementing your search form. NOTE: If you do not have a searchform.php in your active theme directory, then your form is being built using get_search_form(). For the purposes of this article you will need to create a searchform.php in your active theme directory. There isn’t an elegant way to insert additional form elements programmatically so if your theme does not have a file named searchform.php in its directory, please create one. We will be customizing that file to include additional form elements in the search form. Use a Child Theme here! placeholder="<?php echo esc_attr_x( 'Search â¦', 'placeholder' ) ?>"
If you are not sure whether your theme has enabled support for the HTML5 search form, you will need to rename the searchform.php from your Child Theme (so as to restore the default search form) and view your site in your browser, comparing the markup of your search form to the two examples. While the checkbox has been added to the form, ticking it won’t change the search results at all. We need to tie this into SearchWP itself. If writing code makes you nervous, there is an alternate step 2 which you may prefer. SearchWP allows for customization of any engine configuration at runtime using the searchwp_engine_settings hook. We’re going to use that hook to check for our Limit to Titles checkbox being ticked. If it is, we’ll proceed by setting all content type weights to zero except Titles, thereby forcing a search by Title only. The my_searchwp_engine_customizations callback receives two parameters, $settings and $query. The $settings parameter is the engine configuration itself, and the $query parameter is the submitted search. You can uncomment lines 4 and 5 and run a test search to see the full structure of each output in your browser. Lines 7-10 check to make sure that the checkbox to Limit to Titles has been ticked. If it has, the rest of the function iterates through the $settings array, resetting all defined weights to zero excerpt for the title. Finally, the $settings array must be returned back to SearchWP for use during this search. NOTE: This hook does not permanently modify your engine settings, the customization lasts only for this single request. This hook will be applied to any additional searches sent to this search engine during this request, so if you have multiple searches using the same engine on the same page load, they will all use this hook. If this is not desirable you will need to use this self-removing version of the above (see line 49). Instead of iterating through each stored weight in the engine configuration, you could also simply create a Supplemental Engine for each potential outcome and swap out the engine settings entirely. NOTE: The engine label is different than the engine name, the engine name is the monospaced version next to the label of a saved supplemental engine. This achieves the same result as Step 2 but with less code and a UI-based way of configuring the alternate engine.